Motoi Yamamoto is fascinated by the interconnectedness of living things and salt's literal and symbolic role in the pattern of life and death. He creates stunning labyrinths, tunnels and abandoned staircases out of salt. In Japanese culture, salt plays many roles. In times of mourning, it is used to purify the body from death after a funeral, and to ward away evil spirits hiding in the dark corners of homes. In Kono Taeko's story "Final Moments," Asari asks Noriko, "What'll happen if you die before I do? Will you shake salt down on me from somewhere in the sky when I come back from your funeral?" Yamamoto was born in Hiroshima, Japan and began working with salt after his sister's untimely death from brain cancer at only 24 years old. Traces of brain-like images are visible throughout the saltscapes, alluding to Yamamoto's tragic past. Like 3D tessellations, the works seem to be mazes without a clear endpoint, yet Yamamoto directs his works toward a single purpose, meditation. The labyrinths are monumental in both size and in their symbolism. The artist said of his works: "Drawing a labyrinth with salt is like following a trace of my memory. Memories seem to change and vanish as time goes by. However, what I seek is the way in which I can touch a precious moment in my memories that cannot be attained through pictures or writings." He continues, "I always silently follow the trace, that is controlled as well as uncontrolled from the start point after I have completed it." After he finishes displaying an installation, Yamamoto requests the salt is returned to the ocean, making its journey full circle. His impermanent sites of beauty are haunting meditations on life, death and memory, evoking Tibetan Buddhist practices where a work is destroyed after it is completed. 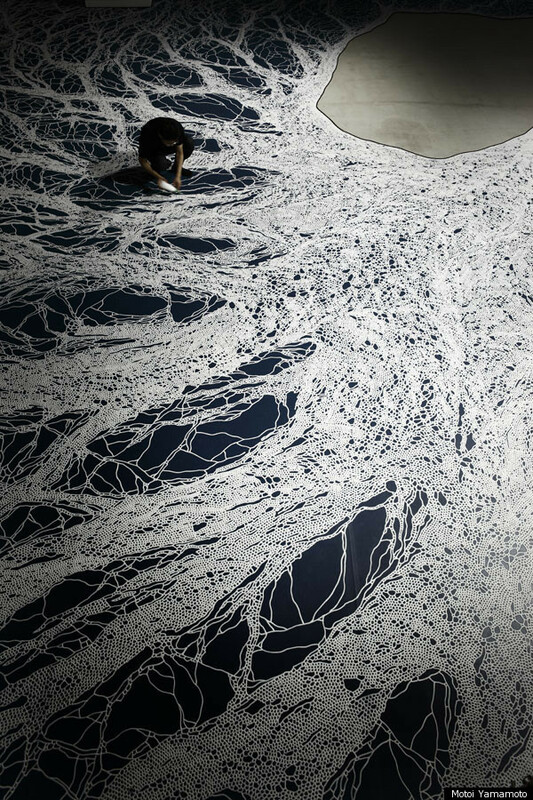 Full of starts and stops, twists and turns, Yamamoto's labyrinthine salt sculptures eventually become one with the Earth.